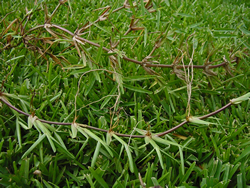 PLANTanswers: Plant Answers > BE SURE YOU ARE GETTING FLORATAM ST. AUGUSTINE GRASS!!! 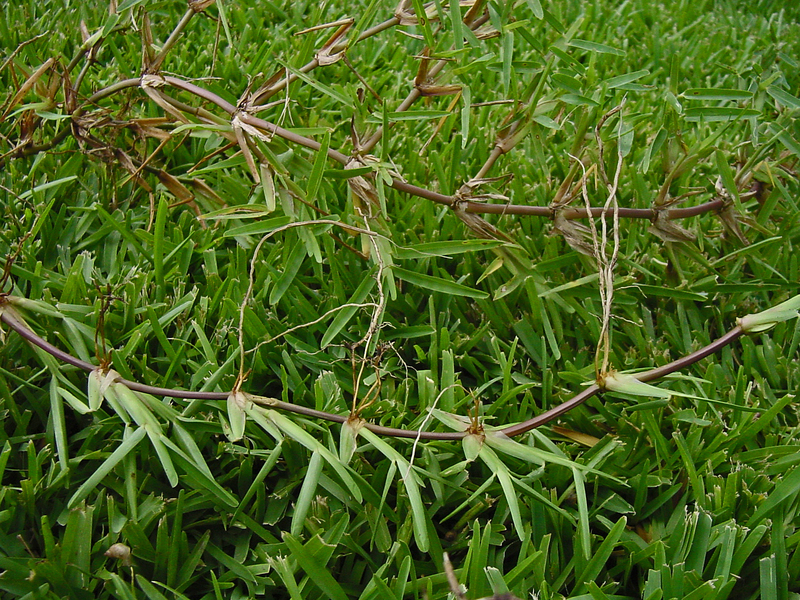 Plant Answers > BE SURE YOU ARE GETTING FLORATAM ST. AUGUSTINE GRASS!!! 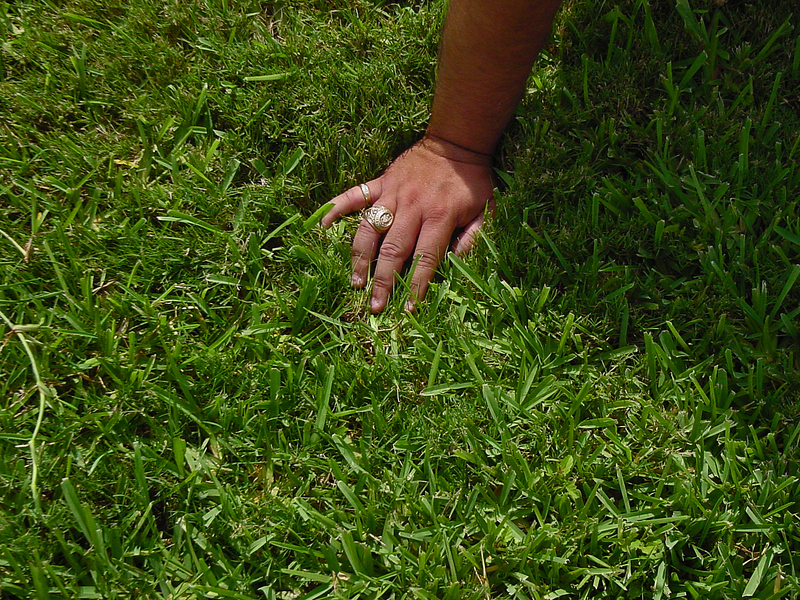 BE SURE YOU ARE GETTING FLORATAM ST. AUGUSTINE GRASS!!! "Floratam is a vigorous, coarse textured St. Augustine grass variety." 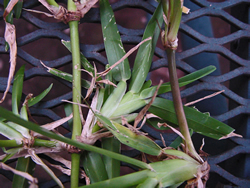 "Stolons of Floratam are large, purplish-red in color (demand this characteristic when purchasing sod)"
Notice purple stolen (runner) on right! 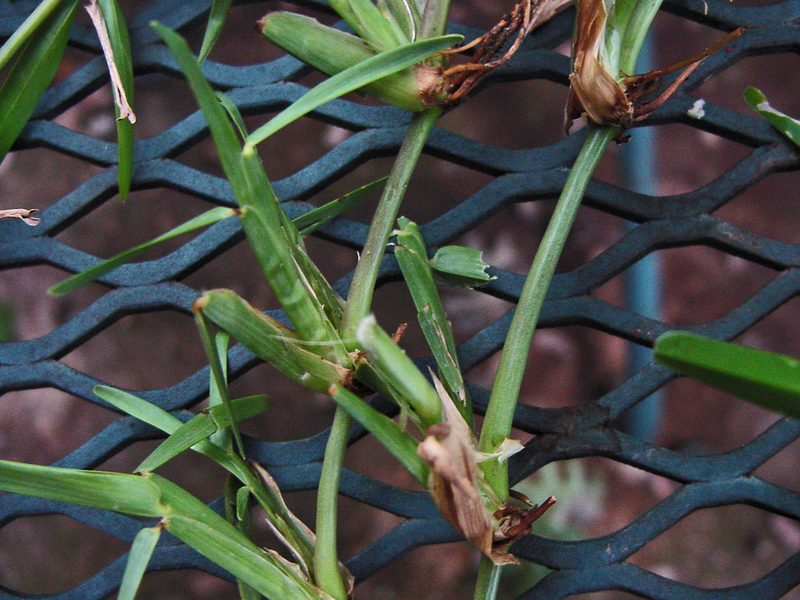 with internodes averaging 3 inches in length. 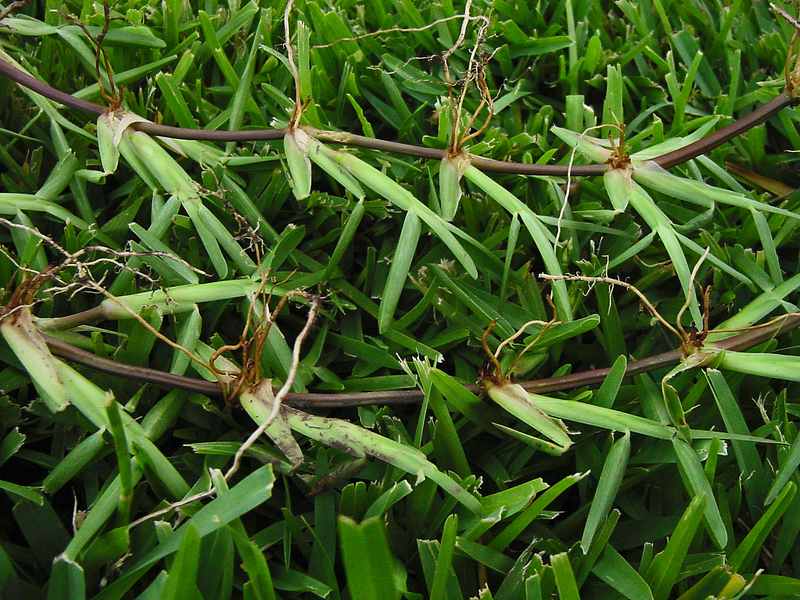 Leaf blades are wider and longer than common St. Augustine grass. 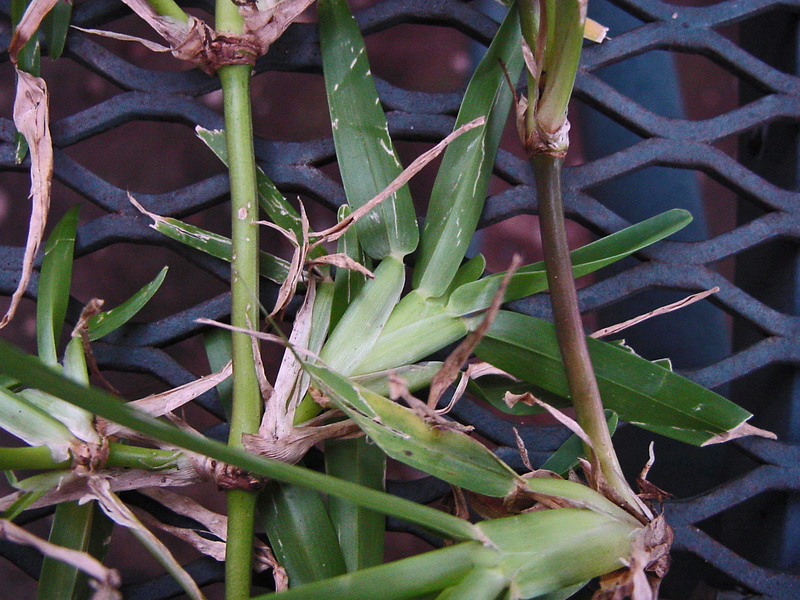 Leaf blades are wider and longer in the top sections of Floratam than in the two runners of common St. Augustine grass in the lower right corner. 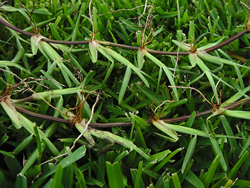 IMPOSTER Hybrid St. Augustinegrass varieties will have smaller leaf blades and bundles as well as smaller stems which are not purple. Hopefully these images and descriptions can help you avoid the problem sent to me in an e-mail on June 18, 2007. I bought 12 pallets ($145 per pallet which is $15 per pallet more than any other St. Augustine hybrid and $45 per pallet more than Raleigh!!) of Floratam St. Augustine. It wasn't until after it was down that I went online to learn more about it. 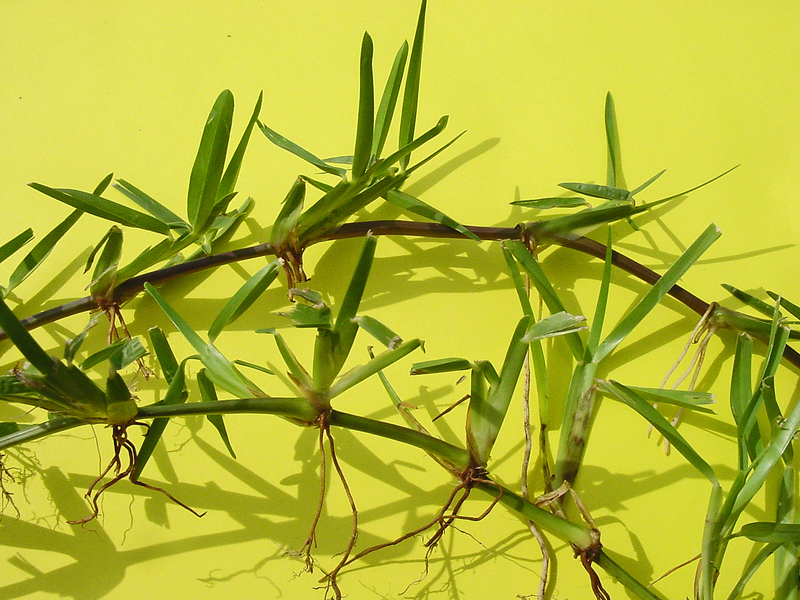 That's when I learned that Floratam has characteristics my grass does not have (purple stolons and this grass produces seeds, it's my understanding Floratam does not). The people I bought it from insist it is Floratam. How can I get it tested or who could I contact to examine it to tell me for sure? I really only want to confirm I got what I ordered and paid a premium price for. I really appreciate any advice you can give me. Thanks! ANSWER: I regret to inform you that you DO NOT have Floratam. 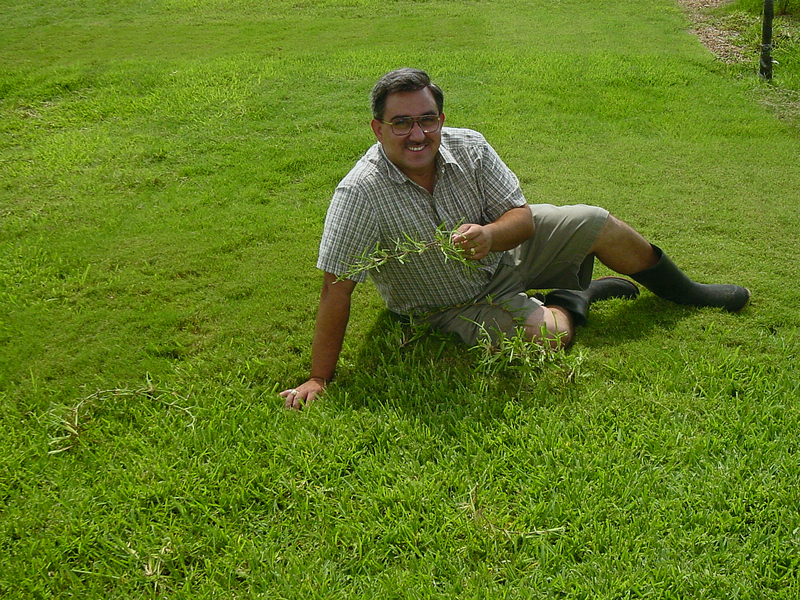 David Rodriguez, Bexar County Extension Horticulturist, and I visited your lawn on Friday, June 29, 2007, and found no Floratam planted in your lawn. Our best guess is that you have been sold Raleigh. You should be able to recover the $180 ($15 per pallet more for Floratam X 12 pallets) difference you paid for the Floratam which you did NOT get. If the people who sold you the mislabeled grass complain, please inform them that $180 is much less than removing and replacing THE ENTIRE PLANTING!!! Sorry this happened and we are working to insure that it does not happen again. THANKS for calling this turf fraud to our attention. Better late than NEVER. 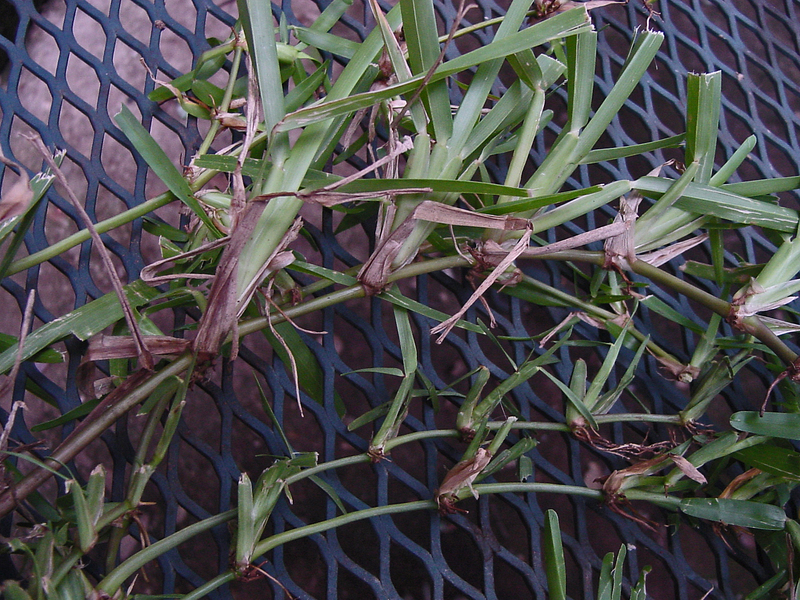 Below are more images taken at the SAWS Drought Test Turfgrass Plots in southern Bexar County on June 29, 2007, to assist other in identifying the real Floratam St. Augustinegrass. 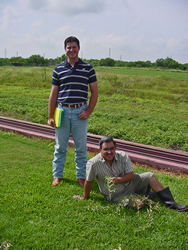 On Friday, June 29, 2007, David Rodriguez, Brady Yecker - a horticulture intern and A&M senior in horticulture, Mark Peterson-Project Coordinator - Conservation San Antonio Water System, and Jerry Parsons, Professor and Extension Horticulturist, went to the drought study site at Bladerunner Farms (Leon Creek). Mark Peterson had a map to the first planting but did not have the plot plan for the second planting. After arriving, Parsons told Mark NOT to show the map or tell where the Floratam plots were located. This site is planted in a randomized, replicated (four times) design. 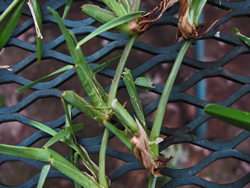 The original (first planted) plot was independently examined by Parsons and Rodriguez. A decision was then voiced as to which were the Floratam plots or sections. Rodriguez and Parsons identified ALL FOUR PLOTS OF FLORATAM within four minutes-NO MISTAKES as confirmed by Mark Peterson with the plot plan. Brady Yecker, who had never seen different grass varieties side-by-side identified ALL FOUR PLOTS OF FLORATAM in the second plot planting -- for which we had no map - within five minutes with NO MISTAKES!!! The following images tell the story. 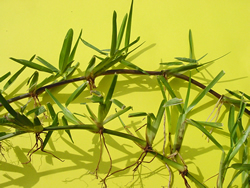 Runners with purple stems, healthy foliage and long, white roots clearly identifies the real Floratam. 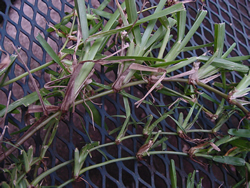 The top, purple-stemmed Floratam grass has characteristic healthy blades and white roots while the bottom St. Augustine grass has diseased leaf blades and brown roots. 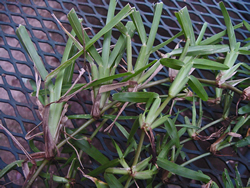 This image of Sapphire shows another St. Augustine that has purple stems as does Floratam but does not seem to perform nearly as well as Floratam in drought studies and has a much smaller leaf mass, smaller stem, shorter internodes, and diseased foliage. 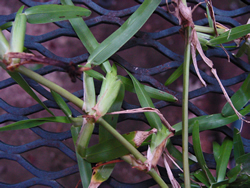 It is difficult to see different textures and color hues in images of grass. 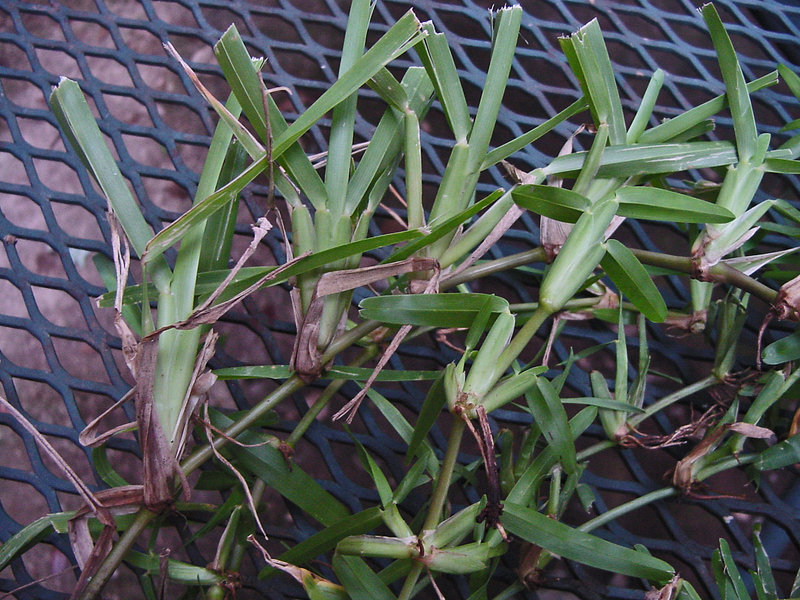 Brady (left) is standing in a different St. Augustine and David (right) is sitting in Floratam with his hand resting on the dividing line between St. Augustinegrass selection. 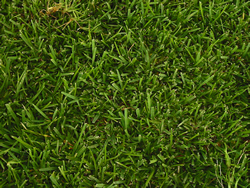 Floratam texture is coarser and the color is more blue-green than green. 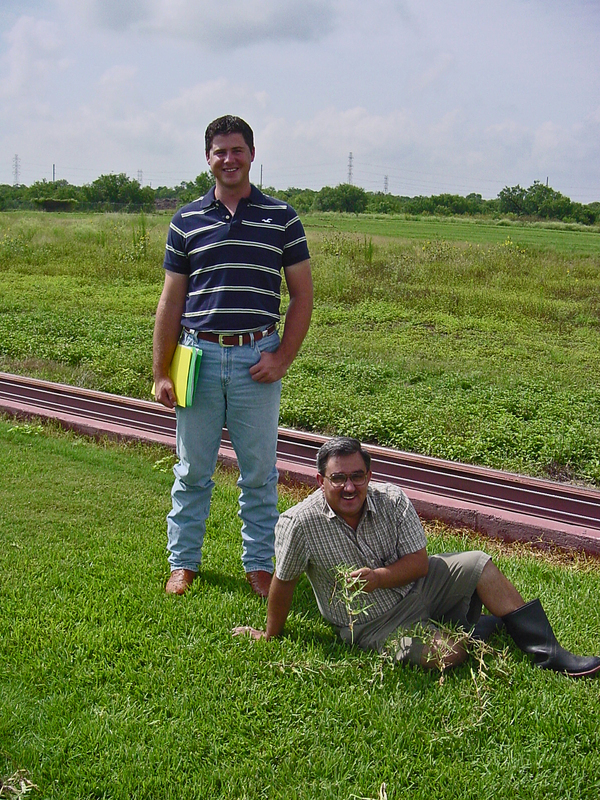 David Rodriguez is sitting in Floratam with his hand on the dividing line between St. Augustinegrass varieties at the SAWS Drought planting. 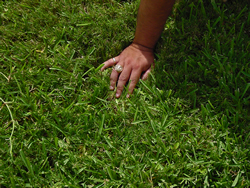 Notice the coarser, thicker Floratam to the right (in the image) of David's hand marking the division of the varieties compared to the sparseness of the grass to the left side of the image. Also notice the Floratam runners INVADING surrounding, weaker varieties. 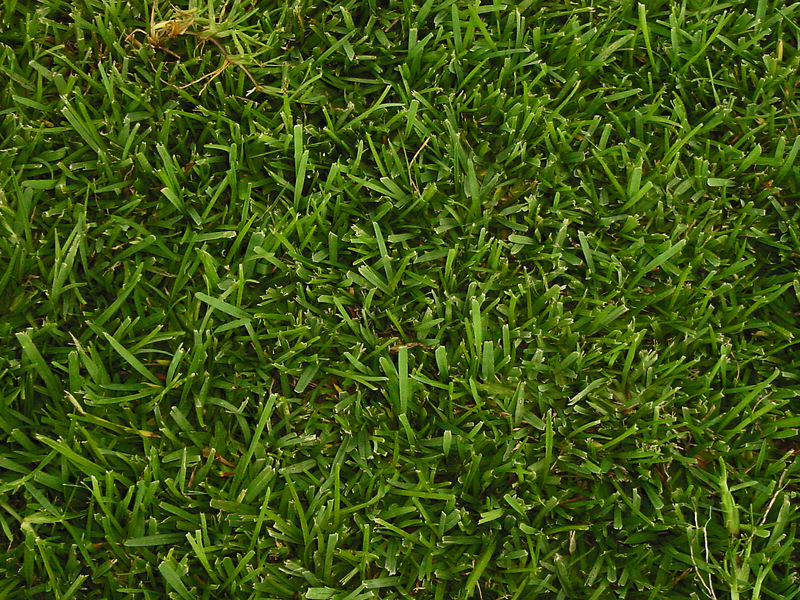 This is pure Floratam St. Augustinegrass which is blue-green rather than green and is described in the official Texas A&M Variety Release in 1972. Click here to download a Floratam Release brochure in pdf format.